Grab a chair and join Chambre Séparée and play along to win your share of the 10k in cash prizes awarded by LeoVegas Live Casino this week. You can choose your own price? To take part in this promotion, you must first register an account with LeoVegas. Next, indicate in your profile that you always offer, accept bonuses and targeted communication. You can do this in your account at institutions. Visit LeoVegas now and start playing! Which price do you choose? 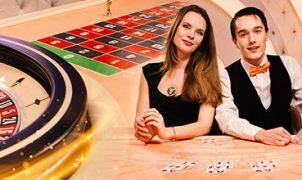 Receive a ticket for every £25 you play in Chambre Séparée at LeoVegas Live Casino. You still have until 1 August 2018 to get your tickets. You can win up to 100 tickets in total. LeoVegas raffles 10 players £1000 vouchers each to use in the gift shop. You can choose from among others telephones, surboards, computers and much more! You can follow the results live at Celebrity Blackjack Party table on Thursday, August 2 at 18:00 CEST. Leo Tip: The live draw will take place at 18:00 on 02/08 at the Celebrity Blackjack Party table. A VIP EXPERIENCE FOR A KING! Join LeoVegas Christmas party with £300.000 free giveaway!